Come double down and hedge your bets with the Des Plaines Community Foundation (DPCF) Casino Fundraiser on Friday, September 7, 2018 from 4 p.m. to 8 p.m. at the 15th annual and only fundraiser at the Cube nightclub at the Des Plaines Rivers Casino. Tickets for the event are $85 per person and will include appetizers, gourmet dinner, open bar and entertainment and the musical stylings of 7th Heaven Band. 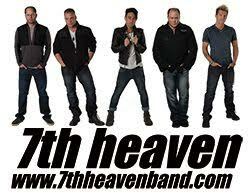 New to the event this year is the popular 7th Heaven Band a local entertainment staple playing more than 250 shows a year, with an average of 100 outdoor events. feature the local 7th Heaven band as entertainment. Journey and U2 at a frenetic pace. valued at more than $200 each. In addition there will be the popular fundraising game called “heads and tails” for guests to wager and win a prize. Silent auction items will include golf packages, spa and sporting events, collectibles, gifts and more. You must be 21 years old to attend. Alliant Credit Union Foundation is the main sponsor of the event with a donation of $5,000. at the food or beverage station as well as in the event brochure. Silent auction sponsorships are also available for $3,000 with company name and logo signs posted on the silent auction table as well as credit in the event brochure. Businesses can sponsor the ‘Big Board’ for $500 or raffle prizes at $2,000 levels with the company name listed in the event brochure. the lives of those that live and work in Des Plaines. Some of the programs include; Neighbors Helping Neighbors Program Committee; Healthy Community/Healthy Youth Program Committee; Intergenerational Program Committee; and Seasons of Service program Committee. deductible contributions as well as from other foundations.